A civil servant accused of leaking a memo reportedly about a possible bombing of an Arab TV station by the US has been charged with a second offence. David Keogh, 49, was charged under the Official Secrets Act in November but another charge was added by prosecutors at Bow Street Magistrates' Court. A preliminary hearing for Mr Keogh and Leo O'Connor, who faces one charge, is due to be held on 24 January. The memo contained alleged comments by US President George Bush. He was reportedly talked out of an attack on television station al-Jazeera in Qatar by Prime Minister Tony Blair. The Whitehouse has dismissed claims Mr Bush considered such a move as "outlandish". Mr Keogh, 49, is accused of passing the minutes to Mr O'Connor, 42, a former MP's researcher, between 16 April and 28 May 2004. Mr Keogh - a former communications officer at the Cabinet Office - faces two charges under the Official Secrets Act. The charge laid on Tuesday relates to the clause of the Act which prohibits "damaging disclosures" of information relating to defence and covers disclosing information which endanger the interests of the UK abroad, seriously obstruct the promotion or protection of UK interests or endanger the safety of British citizens abroad. The previous charge against Keogh is under a section of the Act which covers international relations and the leaking of confidential information obtained from a state other than the UK. Mr O'Connor - former researcher for one-time Labour Northampton South MP Anthony Clarke - faces one charge. The pair, both from Northampton, were released on bail after a brief appearance before Bow Street magistrates on Tuesday. 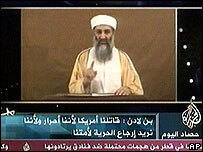 Launched in 1996, al-Jazeera is best known outside of the Arab world for carrying exclusive al-Qaeda messages, including several from Osama bin Laden.